The sanctuary, nursery and both preschool rooms will be closed to all foot traffic from Friday, October 10 at 8:00 am through Saturday, October 11 at 5:00 pm. The carpeting in these areas will be professionally cleaned on Friday and will need time to fully dry in preparation for worship on Sunday, October 12. If you have any questions, please contact Sue V. or the church office. Thank you for your cooperation. WARM (Wrapping Arms aRound Many) is a ministry involving many churches in the area. Each church either hosts or assists a host site in housing the homeless in our community who have nowhere to go during the cold winter nights. The guests arrive at the host site around 5:30 pm, where they are provided a hot meal, a cot for the evening, and some time to freshen up, play games, read, etc. In the morning they are provided with breakfast prior to leaving for the day at 7 am. Stitching Sisters’ next knit-crochet gathering is on Monday, October 13 at 12:00 pm at the Disciples’ Den. Ginger L. will serve as hostess. Please see Ginger or Edna A. if you have any questions. Beginners are always welcome! 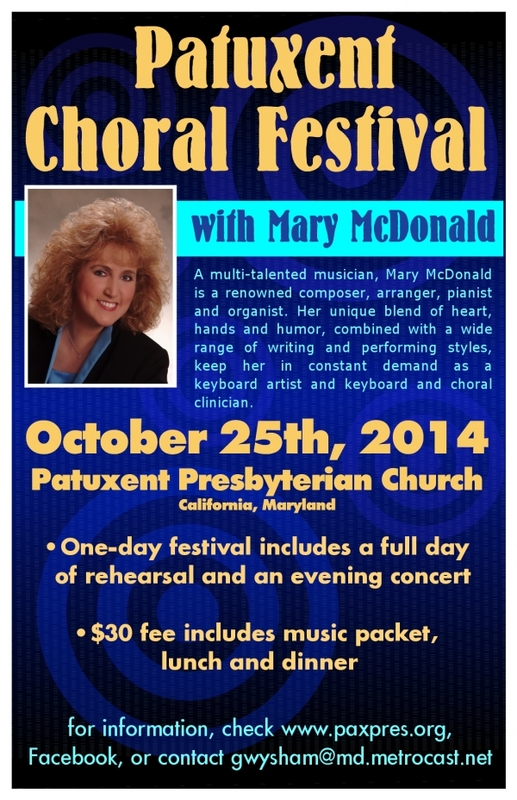 Patuxent Presbyterian Church proudly presents the 2014 Patuxent Choral Festival on Saturday, October 25. We are honored to have renowned choral composer Mary McDonald, who will lead a massed choir of community singers in a day-long (10:00-4:00) rehearsal. The event will culminate in a 7:00 evening concert in which the choir will sing some of the songs learned during the festival. Mary McDonald, who is not only a talented composer but a fantastic keyboardist as well, will include some of her playing skills in the concert. All are invited to this kick-off event at Lexington Park Baptist Church! What does it mean to you to put your faith into action? When we install people into positions of leadership and responsibility in the church, the response they give is, “Yes, and I ask God to guide and direct me.” What if we did the same every day? Try it. While you are standing at the bathroom sink tomorrow morning, tell God you are His servant and ask that He guide and direct you for the day. Some of the ways that you might put your faith into action here at Good Sam are listed in our Activities and Events Catalog. We use it each year as part of our stewardship program as a menu of possible ministries you can get involved with and for visitors to see what ministries are available for them or their children. Take this week to review that catalog. Copies are available in the narthex entryway, along with a Faith in Action form for you to fill out. A leader will follow up with you to give you more information about the ministries you’re interested in, as well as help lead you to a decision about whether that is a place you can put your faith into action. The Fellowship Team would like to express its sincere appreciation for the all the snacks and cookies that were donated for the summer fellowship. Because this was such a blessing, we are going to ask for another cookie, snack and juice collection on October 5 and 12. Here are some snack suggestions: rice crispy bars, gummy bears, goldfish crackers, breakfast bars, etc. Financial donations are also appreciated (checks can be written out to GSLC with “fellowship” in the memo line). This will greatly supplement the autumn fellowship. Thank you very much. Please see Edna, Ginger or Sue V. if you have any questions. What do you do when you have really burned the bridge? I have often wished to have the faith of Abraham. I have wondered what it would be like if the Scriptures were filled with stories of those who managed to come to faith and eventually find themselves with faith like Abraham’s. Perhaps then the Scripture would really be a helpful tool for coming to faith and for finding instruction in living lives of faith. Oh, yes…for many of us this is exactly what the Scriptures are! Perhaps then, this verse from Genesis 15 is one early indication of what the purpose of Scripture is all about. The CareNet Pregnancy Center of Southern Maryland is seeking qualified candidates for the position of Executive Director. The Executive Director has full responsibility for the administrative, development, public relations, and training of staff and volunteers at three pregnancy center locations. Candidates must have at least a bachelor’s degree and be able to demonstrate a vigorous and growing personal relationship with Jesus Christ as well as a strong commitment to the sanctity of human life. Experience in leading groups of staff and volunteers is critical; experience in pregnancy center operations is a plus. For a complete job description or to submit a resume, please send inquiries to Beth Slick at director@carenetsomd.org. You are invited to the Young Life Dessert Banquet featuring Dr. Lee Corder (former chaplain for the Washington Redskins) on Sunday, November 2 from 2:00-4:00 pm at the Bay District Firehouse. Please see the flyer below for information about how to RSVP.